The ECtHR, Second Section, issued a judgment on 1 September in Khlaifia et autres c. Italie (Requête no 16483/12) (official judgment in French) finding that the summary procedures used by Italy in 2011 to quickly return thousands of Tunisians who were reaching Italy by sea during the height of the Arab Spring violated the prohibition of collective expulsion of aliens contained in Art. 4 of Protocol 4 of the ECHR. (Judges SAJÓ and VUĊINIĊ did not find that collective expulsion had occurred and filed a dissenting opinion.) The Court also found violations of Art. 3, Art. 5, §§ 1, 2, 5, and Art. 13 (inhuman or degrading treatment, failure to promptly explain basis for detention, inability to challenge detention, lack of an effective remedy). The Court’s judgment should serve as a caution to the European Commission, EASO, Frontex, and EU member states as they consider new streamlined procedures to process the refugees and migrants reaching Europe; procedures must provide for meaningful individualized processing and individuals must be afforded a meaningful opportunity to challenge an expulsion order, among other requirements. The dissenting opinion of Judges SAJÓ AND VUĊINIĊ (in English), concluding that there had not been a collective expulsion, is well reasoned and reviews the history of the collective expulsion prohibition. 153. La Cour observe qu’en l’espèce les requérants ont fait l’objet de décrets de refoulement individuels. Ces derniers étaient cependant rédigés dans des termes identiques, les seules différences étant les données personnelles des destinataires. 153. The Court observes that in this case the applicants were the subject of individual expulsion orders. They were, however, drafted in identical terms, the only differences being the personal information of the recipients. 154. La Cour a déjà précisé que le fait que plusieurs étrangers fassent l’objet de décisions semblables ne permet pas en soi de conclure à l’existence d’une expulsion collective lorsque chaque intéressé a pu individuellement exposer devant les autorités compétentes les arguments qui s’opposaient à son expulsion. La Cour a également jugé qu’il n’y a pas violation de l’article 4 du Protocole no 4 si l’absence de décision individuelle d’éloignement est la conséquence du comportement fautif des personnes intéressées (Hirsi Jamaa et autres, précité, § 184). 154. The Court has already held that the fact that multiple foreigners are subject to similar decisions does not in itself lead to the conclusion that there was collective expulsion when each person was individually able to present arguments against expulsion to competent authorities. The Court has also held that there is no violation of Article 4 of Protocol No. 4 if the absence of individual expulsion decisions is due to the wrongful conduct of the affected persons (Hirsi Jamaa and Others, cited above, § 184). 155. La Cour relève de surcroît qu’à la différence de l’affaire Hirsi Jamaa et autres (précité, § 185), en l’espèce, à l’instar des autres migrants débarqués sur l’île de Lampedusa en septembre 2011, les requérants ont fait l’objet d’une procédure d’identification. Le Gouvernement le souligne à juste titre (paragraphe 152 ci-dessus). Les requérants reconnaissent par ailleurs qu’immédiatement après leur débarquement à Lampedusa, les autorités de frontière italiennes ont enregistré leur identité et relevé leurs empreintes (paragraphe 149 ci dessus). 155. The Court further notes that, unlike the case of Hirsi Jamaa and Others (cited above, § 185), in this case, like the other migrants who landed on Lampedusa in September 2011, the applicants were the subject of an identification procedure. The Government rightly points this out (paragraph 152 above). The applicants also recognize that immediately after landing in Lampedusa, the Italian border authorities registered their identity and took their fingerprints (paragraph 149 above). 156. La Cour est cependant d’avis que la simple mise en place d’une procédure d’identification ne suffit pas à exclure l’existence d’une expulsion collective. Elle estime de surcroît que plusieurs éléments amènent à estimer qu’en l’espèce l’expulsion critiquée avait bien un caractère collectif. En particulier, les décrets de refoulement ne contiennent aucune référence à la situation personnelle des intéressés ; le Gouvernement n’a produit aucun document susceptible de prouver que des entretiens individuels portant sur la situation spécifique de chaque requérant auraient eu lieu avant l’adoption de ces décrets ; un grand nombre de personnes de même origine a connu, à l’époque des faits incriminés, le même sort des requérants ; les accords bilatéraux avec la Tunisie (paragraphes 28-30 ci dessus) n’ont pas été rendus publics et prévoyaient le rapatriement des migrants irréguliers tunisiens par le biais de procédures simplifiées, sur la base de la simple identification de la personne concernée de la part des autorités consulaires tunisiennes. 156. However, the Court is of the opinion that the mere implementation of an identification procedure is not sufficient to exclude the existence of collective expulsion. It considers moreover that several factors lead to the consideration in this case that the expulsion at issue was indeed of a collective nature. In particular, the expulsion orders did not contain any reference to the personal circumstances of the affected persons; the Government did not produce any document that could prove that individual interviews regarding the specific situation of each applicant would have occurred before the adoption of these orders; many people of the same origin experienced, at the time of the incriminating facts, the same fate as the applicants; the bilateral agreements with Tunisia (see paragraphs 28-30 above) have not been made public and provided for the repatriation of irregular Tunisian migrants through simplified procedures, based on the simple identification of the person concerned by Tunisian consular authorities. 157. Cela suffit à la Cour pour exclure l’existence de garanties suffisantes d’une prise en compte réelle et différenciée de la situation individuelle de chacune des personnes concernées (voir, mutatis mutandis, Čonka, précité, §§ 61-63). 157. This is sufficient for the Court to rule out the existence of sufficient guarantees of a genuine and differentiated consideration of the individual circumstances of the persons involved (see, mutatis mutandis, Čonka, cited above, §§ 61-63). 158. Au vu de ce qui précède, la Cour conclut que l’éloignement des requérants a revêtu un caractère collectif contraire à l’article 4 du Protocole no 4. Partant, il y a eu violation de cette disposition. 158. In view of the foregoing, the Court concludes that the expulsion of the applicants took on a collective character contrary to Article 4 of Protocol No. 4. Accordingly, there has been a violation of this provision. On 17 November the Second Section of the European Court of Human Rights communicated the case of Hirsi and others v Italy, Requête no 27765/09. The case was filed on 26 May 2009 by 11 Somalis and 13 Eritreans who were among the first group of about 200 migrants interdicted by Italian authorities and summarily returned to Libya under the terms of the Libya-Italy agreement which took effect on 4 February 2009. The Applicants were intercepted on 6 May 2009 approximately 35 miles south of Lampedusa. Click here for previous post on the case. More details on this development later. Italy has done itself and neighbouring countries a disservice by repeatedly speaking of an “exodus of biblical proportions” and by suggesting that many hundreds of thousands of migrants are poised to take to the sea to try to reach Italy and Malta from Libya. These estimates are in all likelihood grossly exaggerated. But even if you agree that Italy’s feared numbers are exaggerations, the fact that no irregular migrant or asylum seeker has apparently yet left Libya by sea is not at all surprising. Libya is in chaos and few people are likely to try to depart the country by sea until the level of violence begins to diminish. Libya has (or had) a functioning network of human traffickers and they will be ready to begin exploiting the chaos and to take advantage of desperate people seeking to flee at some point in the future. If Gaddafi manages to remain in power, once he is no longer concerned with his personal survival, his thoughts will at some point turn to revenge. Libya will presumably cease cooperating with Italy on the bi-lateral pushback practice, and Gaddafi will tolerate or encourage irregular migration towards Europe. So Italy is correct in that there is a real threat of significant numbers of migrants and asylum seekers leaving from Libya some time in the near future. The numbers could easily and quickly surpass the 6,000 who have left Tunisia for Lampedusa. Could the numbers surpass 30,000? 30,000 asylum seekers entered Sweden last year (population 9 million – Italy’s population is 50+ million) and Sweden has not received any extraordinary EU assistance as a result. Could the numbers exceed the hundreds of thousands that fled the Balkan wars in the 1990s? Possible, but probably not very likely. ASIL has just published an Insight article about M.S.S. v. Belgium & Greece written by Tom Syring, Co-chair of the ASIL International Refugee Law Interest Group, who currently serves at the Norwegian Immigration Appeals Board. Excerpt from the conclusion: “Apart from criticizing Greece for the current conditions of detention and subsistence awaiting asylum seekers, and Belgium for ‘intentional blindness’ for failing to properly scrutinize the adequacy of protection against refoulement in Greece, despite the fact that circumstances had called for application of the sovereignty clause, the Grand Chamber’s judgment exposes flaws in the current European asylum regime. Of possible interest to a few, here are two links to the portions of yesterday’s plenary session of the European Parliament where the Common EU Asylum System and the migration emergency in Italy were discussed by a few MEPs and Commissioner Malmström. 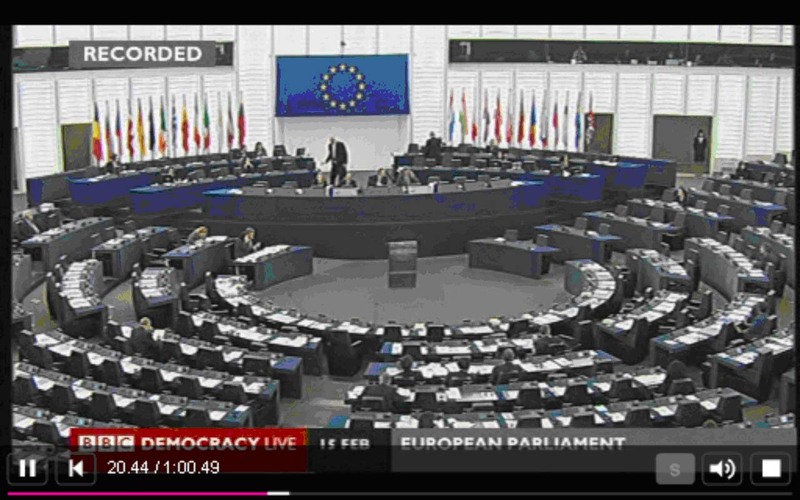 As you can see from my screen shot below of the debate regarding the migration emergency, very few MEPs were in attendance. Click here (Common EU Asylum System) and here (migration emergency) for link to the BBC’s Democracy Live site with the video. These agenda items are scheduled to be considered at 16:00 or at the end of the preceding debate.